Please accept our apology for any problems introduced with version 2.31. If you encounter any further issues with the latest version of RSPlot, we would greatly appreciate your feedback. Compatible with Windows XP, Vista, 7, 8, 8.1. Here is a convenient way to display your electronic data just as a network analyzer would! 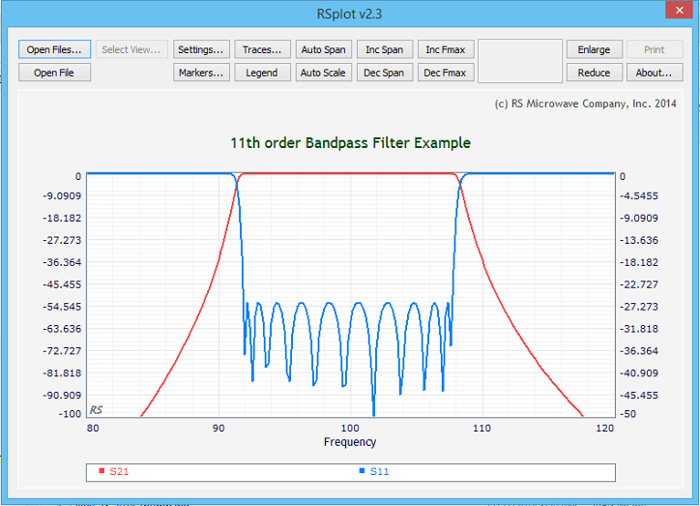 Use RSPLOT™ when you receive a filter with electronic or simulation data attached and you wonder how its plotted response looks. RSPLOT™ is an S-parameter data viewer. The program reads up to five S2p files simultaneously and plots magnitude, phase and delay of the two port S-parameters for each file. It is written for PCs and runs under Windows. RS Microwave Company is pleased to make this program available to its customers, free of charge, as part of its customer service. RSPLOT™ does not require installation as it can be copied and run from any directory on your PC. Simply double-click on the .EXE after downloading. After you launch the program, click Load Data to load up to five S2p files. The S2p file format was originally created for Touchstone and has the extension .s2p. S2p files can be stored with various types of data such as S, Z, Y, H, or T parameters. RSPLOT™ can read S2p files of different network parameters; however, it converts to and plots only S-parameters. Every S2p file starts with an option line which starts with a # character. It tells the reader the frequency unit used, network parameter type, value pair format type, and optional termination reference. The following lines contain frequency and parameter value information. Each line consists of one frequency point value and a pair of values for each network parameter - thus, a total of 9 numbers. The pairs are formatted using DB, MA or RI corresponding to dB-angle, magnitude-angle and real-imaginary formats respectively. Please refer to a Touchstone reference for further information. After a file is loaded, you can select from available traces of data by clicking Select View... In the dialog box, check desired boxes to add them to the plotted traces. You can plot log-magnitude, phase and delay of S11, S21, S12 and S22. Short cut buttons are provided for mostly viewed data combinations. Here, IL (insertion loss) and RL (return loss) are frequently used "filter design" terms and they refer to -20log|S21| and -20log|S11| respectively. At the top of the window, RSPLOT™ provides several buttons to control the content and appearance of the plotted graph. 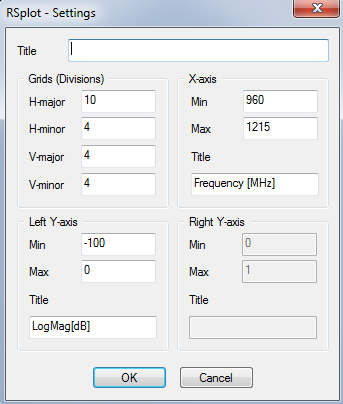 First group of buttons are for setting the min-max ranges and titles of axes, traces and markers. The first button is called Settings... and by clicking it, you can change the titles and displayed ranges of all three axes and number of horizontal and vertical grids. You can also change the title of the graph which is left blank by default. The second button, Traces..., allows you to delete or rename the traces in the current graph. Once a trace is selected and "deleted", it will be marked as "~deleted~" in the list box. Marking a trace won't delete it until you click OK. 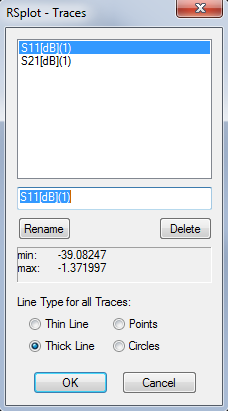 Therefore if you delete a trace by mistake, you can remove this text from the name and undelete the trace. 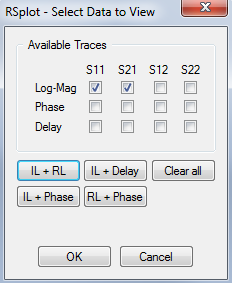 You can also change the line type for the traces such as: thin line, thick line, point or circle by clicking the options provided in the Traces dialog box. You can also add or delete markers to the graph by clicking Markers... button. Markers allow fast checking of the values of S-parameters at specified frequencies. 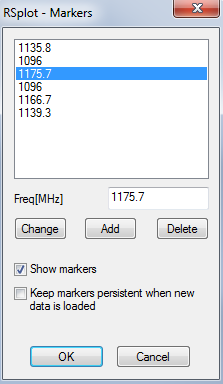 In the Markers dialog box, type the value of the marker frequency in the space provided. Then click Change if you want to change the value of the selected marker, or click Add if you want to add the marker to the list. You can also delete a selected marker by clicking Delete. The checkbox option Show markers shows or hides the legend in the bottom of the plot. The second option, Keep markers persistent when new data is loaded, is used to copy the markers into subsequent plots so that the values of different data sets can be quickly compared. For example: where the data from units of the same part are saved as different files, by loading one after another, you can compare the change in values at the same frequency markers. The last button in the settings group is Legend and it is a shortcut to show or hide the legend area right under the plot area. The next group of buttons are shortcut scaling buttons. The first two buttons, Inc Span and Dec Span increase or decrease the frequency span of the plot by keeping the center frequency fixed. The Auto Span button sets the plotting frequency range to the maximum range found in the traces. Finally, the Auto Scale button automatically scales the Y-axes which can still be manually altered using Settings... button. The Inc Fmax and Dec Fmax buttons increase or decrease the frequency range while keeping the minimum frequency fixed. RSPLOT™ also provides point information where you will find the value of all three axes when you drag the mouse along the plot area. This is useful when you want to view the value of a point roughly. As of version 2.0, you may also left-click on a specific point to automatically place a marker at that point. You may find the point information to the left of the About button which is located on the top right. The final group of buttons, Enlarge and Reduce are resolution adjustments which allow RSPLOT™ to expand for larger displays. You can print the plotted data to a printer by clicking the Print button. A printer settings dialog box appears waiting for you to change or approve settings. You may temporarily change the settings for the current printout and print the data. If you want to make your settings default, for example, landscape paper orientation, make your changes through Start/Settings/Printers. RSPLOT™ requires minimum 3 frequency data points otherwise the program gives an error and does not plot the data. It can also read up to 4,096 points maximum. Data beyond 4,096 points is simply skipped with a simple warning. Finally for convenience, RSPLOT™ converts Hz, KHz frequency values into MHz. Added Persistent X and Y scales options to Settings dialog. When a new file is opened, previous scaling can be retained if desired. Added the ability to plot up to 10,000 points per file. Your input is welcomed on RSPLOT™. EMAIL Sales regarding any problems you encounter or suggestions to make this program better. We hope you find it useful.